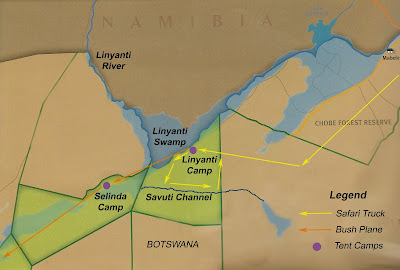 This is an account of our 3-week trip to Southern Africa in September 2009. For details regarding where we stayed and what safari company we used, click here. To start at the beginning of our adventure, click here. After a few action pack game drives in Linyanti, we left behind the swamp and headed southwest to Selinda Camp. The airplane was a small turbo prop and the pilot cruised a few thousand feet off the ground. It was a bit disturbing to see elephants looking so tiny, yet so very close at the same time. Definitely a different experience than the 30,000 feet that is the norm on a jet. Selinda, like the rest of the waterways in the areas, is enjoying plentiful water for the first time in many years. People rarely swim in African streams due to hippos and crocodiles yet we spent a lot of time paddling in the newly flowing rivers. The dangerous beasts hadn't ventured this far down the waterway. yet. Of course, the mud and the muck made driving a bit difficult. I can’t tell you how many times we had to dig the vehicle out of the swamp. Well, that isn’t quite fair. Our guide Russell was the main digger. We became very proficient at watching him dig the truck out of pits. I am also fond of the African Hoopoe (Upupa africana), probably because I did a case study of the bird in one of Dr. Craig's biology courses in college. He has a rather jaunty look about him, eh? And of course, the never-ending dragonfly photos. Africa is not for bug-adverse folks. We saw an ostrich in Linyanti but it was fleeting. Later, on our way through South Africa, we would happen upon an ostrich running along the road. I later decided it was a farmed ostrich though and that didn't really count. This nest and egg ensemble was displayed on the table at Selinda. It would have made a massive omelet. And that, my friends, is the end of the pictures from Selinda Camp. Chris got massively sick during our stay at Selinda and I was feeling under the weather as well so we mostly used the time to sleep and recover. And, in Chris' case, puke his guts out. But we were back in working order by the time we made it to the fabulous Okavango so that was good.